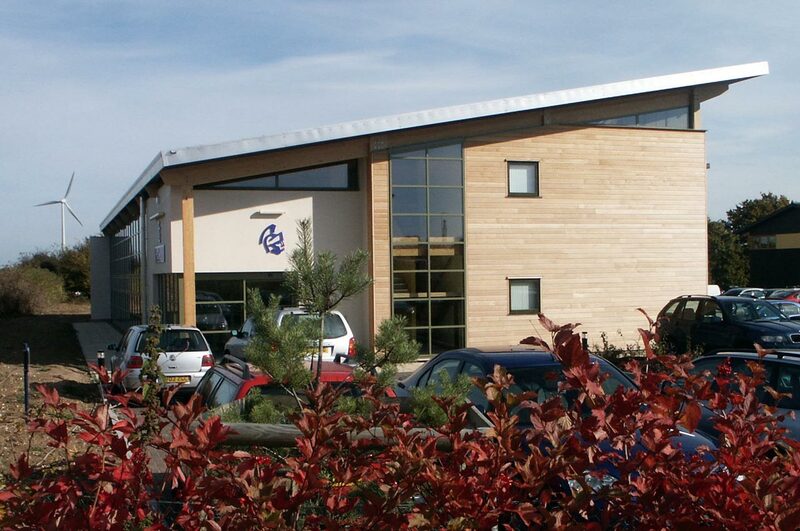 A new regional office for Mansell Construction Services located on the EcoTech Business Park in Swaffham. The building is designed to incorporate as many environmental building techniques as possible within the context of a commercial office development. The structure is a glue laminated timber frame with timber stud infill and large areas of timber cladding. High levels of insulation in the wall help improve energy efficiency. The insulation material is cellulose fibre, which is a cost effective recycled product with the same performance characteristics as other insulation materials. High levels of glazing on the North side of the building provide good day lighting without the risk of summertime overheating. This aspect also affords views to the wind turbine which is a prominent feature of the Business Park. The simple building form provides the flexibility for future expansion and the open plan internal space fosters a good working environment. The open arrangement to the first floor is an important element in the strategy for natural ventilation of the space. Overall the project has been very successful for Mansells not only improving their working environment but also projecting a key message regarding the importance of sustainable construction to a major contractor in the region.